If you’re over the age of 25 you might feel like the odd-one-out if you’re thinking about going back to school. You shouldn’t, though. Nearly 40% of college students are considered adult learners, over the age of 25. Going back to school as an adult has some major benefits. First and foremost you’re far more likely to know what degree to go after and what workload and pay to expect. Also the work experience you’ve already obtained can translate to credits. And last, adult learners with money management experience are less likely to abuse student loans. Clearly, waiting to go to college until you’re a bit older isn’t a terrible idea. 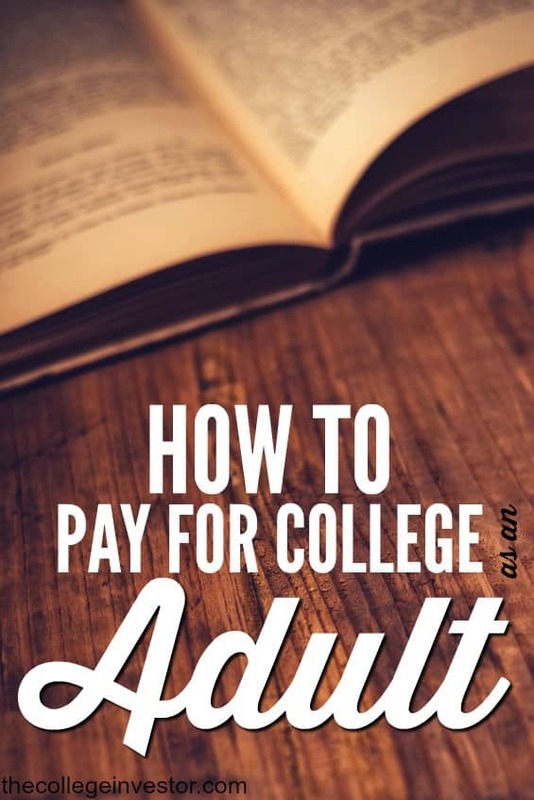 If you’re ready to advance your education here’s how to pay for college as an adult. Once you know what degree you’re going after you’ll have to make the decision of where to pursue your education. Different schools and programs will come with different costs. It’s definitely worth comparing your options and opting for a lower cost school like a community college if that’s an option. You can also check into online schools if you’re needing to work around an already busy schedule. Luckily, there are many options for busy adults with work and families to tend to. Scholarships are not just for high school students. There are thousands of scholarships specifically for adult learners and you should looks into them. Here’s where to look for scholarships. Aside from scholarships there are grants. Grants are most commonly awarded by the government and are money you can use for college that you don’t need to pay back. Don’t make the assumption that you won’t qualify without first checking. You can see if you qualify for grants by filling out the FAFSA online or meeting with your school’s financial aid office. Federal Pell Grant – This is the most popular type of grant awarded by the federal government. The maximum payout is $5,815 for the 2016-2017 school year. The amount you’re awarded relies upon your financial need, the cost of your schooling and whether you’re a part-time or full-time student. FSEOG – Awarded to students of financial need who qualified for the Pell Grant and haven’t obtained a bachelors. You can receive $100-$4,000 per year through this grant. TEACH Grant – This grant is for students who plan on becoming teachers and are willing to sign a contract to work in high-need areas for a specified period of time. You can receive up to $4,000 per year through this grant. Since the average college-aged student is an adult many colleges have started allowing adult learners to ‘cash-in’ their work like experience in exchange for college credits. While there will be a cap on the amount of credits you can get you should most definitely see if there are ways for you to cash in on your current knowledge. GetEducated.com has an in-depth article with five different ways to turn your experience into credits. A 529 plan is a savings or investment account specifically meant for college savings. As an adult you can open a 529 for yourself. One of the biggest reasons to open a 529 is to benefit from the tax breaks. A 529 works much like a Roth IRA. Your 529 earnings won’t be subject to federal income taxes. In addition many states (34) offer additional tax breaks. Each state will set its own limits for how much can be stashed away in a 529 plan each year. Also, if you have family members who want to help you pay for your education they can contribute up to $14,000 per year while avoiding gift-tax consequences. I recently spoke to Kari Singleton, a 48 year old respiratory therapist, who went back to school to obtain her bachelor’s degree. When asked what made her take the leap and go back to school one of the biggest motivators was that her employer paid for the bulk of her continuing education expenses. This is a common scenario for many professionals wishing to further their education. If you’re employed and the degree you’re wanting to obtain will advance your career or benefit your employer you should check and see if your employer will cover some of the cost of education. Before taking on any type of college debt check and see if your employer offers tuition assistance. 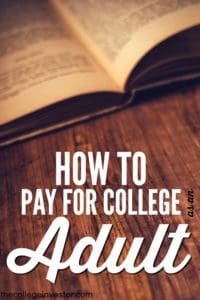 Once you’ve looked into all of the alternative ways to pay for college you may be left with a bill that needs taken care of. In this event you can utilize student loans. Student loans are not evil. The problem many students have with loans is they overused them to pay for a degree that doesn’t provide a high enough income to pay the debt back in a timely manner. You can avoid this. If you use debt in a smart way, to invest in yourself and your education, then utilizing a student loan can be a good option. Just be sure to only take out what you need to cover the cost of your education. If you’re an adult who has went back to school what was the primary way you paid for schooling?